Last time, we covered the details given about most of the events of the Flood in this incredible year of the life of Noah. Noah, his wife, his sons, and his sons wives, as well as all of the animals at this point have been on the ark for 285 days and the ark has been resting on the mountains of Ararat for 128 of those days. Noah has just finished sending out the raven and the dove 3 times with the dove not returning the third time. 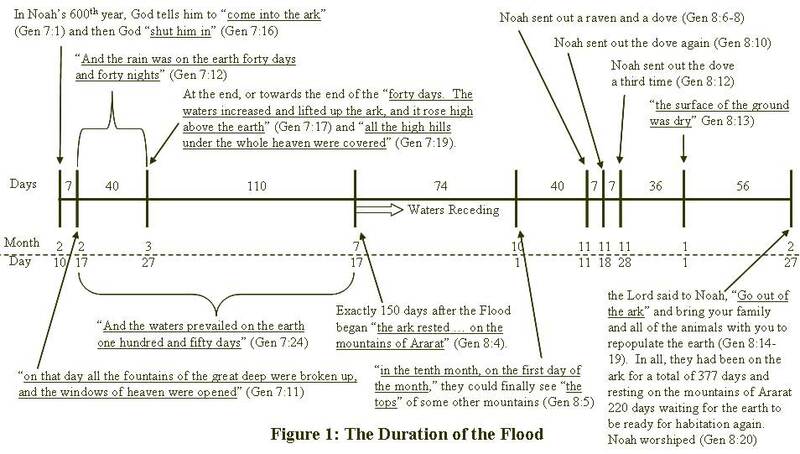 Noah waits another 36 days after the dove does not come back to remove the covering of the ark and clearly observe that “the surface of the ground was dry” Gen 8:13). Noah was now 601 years old and it was “the first month, the first day of the month” of a new year for Noah (Gen 8:13). They had been in the ark for a total of 321 days and the ark had been resting on the mountains of Ararat for 164 days. Yet, God was still not ready for them to come out of the ark. For it was another 56 days “in the second month, on the twenty-seventh day of the month” before the Lord said to Noah, “Go out of the ark” and bring your family and all of the animals with you to repopulate the earth (Gen 8:14-19). In all, they had been on the ark for a total of 377 days and resting on the mountains of Ararat 220 days waiting for the earth to be ready for habitation again. Note: a detailed illustration of the entire timeframe is available on our website.